Peripheral blood mononuclear cells (PBMCs) are blood cells that have a round nucleus. PBMCs consist of lymphocytes, monocytes, and macrophages. These blood cells carry the duty of fighting infections as part of the immune system response. Typically about 75% of the lymphocyte population consists of T cells (CD4+ and CD8+ cells ~75%), with the other 25% being B cells and Natural Killer (NK) cells. 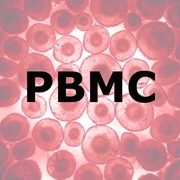 � PBMCs: these human peripheral blood cells consist of the lymphocyte and monocyte fractions of whole blood. The mononuclear cells derived from adult peripheral blood contain large numbers of mature immune cells. 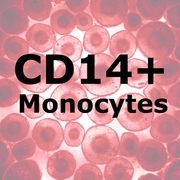 � CD14+ Monocytes: are immature phagocytic cells that circulate in blood, phagocytize and degrade microbes and particulate matter. Once inside tissues, monocytes mature into macrophages. 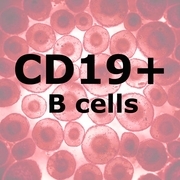 � CD19+ B Cells: are humoral immune response lymphocytes, with the primary duty of making antibodies against antigens, perform the role of antigen-presenting cells (APCs), and eventually developing into memory B cells after activation. � CD4+ Helper T Cells: play a crucial role in establishing and maximizing the capabilities of the immune system. These cells are unusual in that they have no cytotoxic or phagocytic activity; they cannot kill infected host cells or pathogens. CD4+ T cells are essential in determining B cell antibody class switching, in the activation and growth of cytotoxic T cells, and in maximizing bactericidal activity of phagocytes such as macrophages. 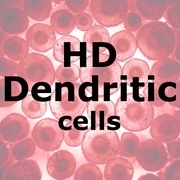 � Dendritic Cells: their main function is to process antigen material and present it on the surface to other cells of the immune system. They act as messengers between the innate and adaptive immune systems. Once activated, dendritic cells migrate to the lymphoid node where they interact with T cells and B cells to initiate and shape the adaptive immune response. 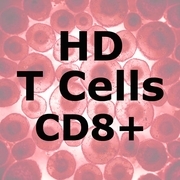 � CD8+ Cytotoxic T Cells: a sub-group of T lymphocytes that are capable of inducing the death of infected somatic or tumor cells. They are recognized as Cytotoxic T cells once they become activated and are generally classified as having a pre-defined cytotoxic role within the immune system. 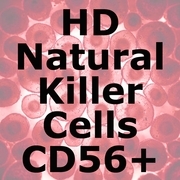 � CD56+ Natural Killer (NK) Cells: these cytotoxic lymphocytes constitute a major component of the innate immune system and are able to kill target cells without prior exposure. NK cells are able to decipher between self and target cells then release small cytoplasmic granules of perforin and granzyme proteins to induce programmed target cell death. The ImmunoPure NP Normal Human Cells are isolated from the peripheral blood (buffy coats) of healthy human adult donors performed at IRB-approved and FDA-licensed blood banks across the United States. The lymphocyte and monocyte fractions are isolated from whole blood using apheresis, a technology in which the blood of a donor or patient is passed through an apparatus that separates out these fractions, and returns the remainder to the donor�s circulation. After collection, the cells are treated with Ficoll� in order to deplete granulocytes, and red blood cells. These PBMCs are immediately cryopreserved by decreasing the temperature by 1 degree Celsius/minute down to -170�C and using proprietary reagents to ensure high survival and recovery rates. The ImmunoPure NP cells are high quality products and research tools that represent a diverse and heterogeneous population of donors.